Would you like to begin exploring your health care career as a freshman—perhaps even earn your professional degree a year early? 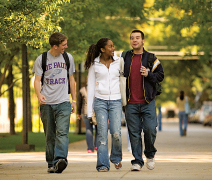 • In 2014, The Princeton Review recognized DePaul as one of the “Top 10 College Towns,” the only Illinois college or university receiving that distinction. DePaul’s many study abroad programs enable students to expand their world-view while living and learning in a foreign country for one or more quarters. Some options include Beijing, China; Budapest, Hungary; Istanbul, Turkey; Osaka, Japan; Paris, France; and Rome, Italy. As a freshman, you can participate in first-year study abroad programs, which offer students the chance to travel to China, Ireland, Italy, Peru, Scotland, and many other countries. In DePaul University’s Pathways Program, you’ll learn how to prepare for admission to selective professional programs—including Medicine, Pathologists’ Assistant, Pharmacy, Physical Therapy, Physician Assistant Studies, and Podiatric Medicine—from faculty members who teach in them. The Pathways Program is part of the Alliance for Health Sciences between DePaul and Rosalind Franklin University of Medicine and Science. Our faculty members work together to design curricula that emphasize interprofessional collaboration and hands-on experience. Together, we’ll provide you with a strong undergraduate and liberal studies foundation, contemporary professional health education, and state-of-the-art medical training facilities. You don’t have to declare your interest in a specialty when you begin; we let you explore your options to find the health career that’s best for you. Key undergraduate classes are taught or co-taught by faculty from Rosalind Franklin, exposing you to professional perspectives. Upper-level classes average 25 students or fewer. You’ll explore issues with classmates who are pursuing related careers, from direct patient care to hospital administration, preparing you to succeed in interprofessional practice settings. You can pursue a traditional four-year program or an accelerated three-year option. If you’re accepted into the accelerated program, you’ll spend three years at DePaul then complete your undergraduate requirements at Rosalind Franklin while simultaneously beginning your graduate studies. You’ll save the time and expense of a year of study. The newly developed Early Opportunity Program is open to select Pathways Program students pursuing three- or four-year degrees. The program offers an early admission decision into one of six professional programs at Rosalind Franklin: Medicine, Pharmacy, Podiatry, Physician Assistant, Pathologists’ Assistant, or Physical Therapy. 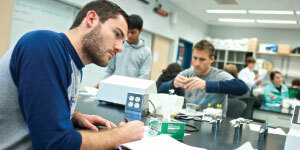 It also includes a waiver for standardized entrance exam requirements (MCAT, PCAT, etc.). Admission opportunities occur after freshman, sophomore, or junior year. You’ll make connections throughout Chicago, a world-class health care hub. And you’ll explore renowned museums; legendary theatre, music, and sports; great restaurants; and historic Lincoln Park. 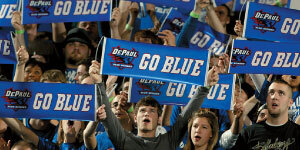 It’s time you found out more about DePaul. • The College of Computing and Digital Media, featuring one of the nation’s largest and most innovative Information Technology programs, includes leading courses in animation, computer science, and game design.